Pretty dangling earrings are almost every girl’s weakness. These little additions in place of studs change the entire look of our face. I love dangler earrings too. Although, some other earrings have my heart. The second studs and the third studs, that is the second and third hole piercings. It is a personal choice that gives me a high, makes me look more feminine and confident, has elegance. Beyond everything, the transition from painful to beautiful is truly fulfilling. As of today, I have all these 6 piercings neat, clean, dry and well healed and they are all open to any metal, make or brand of jewellery – no pain, no allergy (never had), no more hide-and-seek between ‘healing and healed and will-heal’. That makes me quite complacent, grinning ear to ear - literally - because around until 2 years back, this was not the scenario. It is a blessing that we do not recollect things that we witness before the age of 3 or 4. My earlobes were pierced for the first time when I was 3 months old. I am told that I cried, obviously. But kids cry, why care a lot. Sounds nasty? Now take this. We got our daughter’s earlobes pierced at 4 months. She cried a lot, while I held her tight and still so they do not judge the centre of the earlobe wrong. Once home, she weeped and slept and forgot all about it. Now, she is the most beautiful toddler around (I am a typical mother) flaunting cute earstuds. I have been a wee bit jinxed, (actually more than a wee bit) with all my ear piercings, but would I ever give up on it? Ha! No! I adore these gorgeous embellishments. Flashback to 1999-2000. I don’t remember the exact year, but I was in school. All of us cousins were playing Chasing game or Tag in a ground which was also utilized by elder guys to play volleyball and there was an open net. We were running as if our life depended on this game. And my gold studs got stuck on the net and it freed itself from my ear by tearing the earlobe. For a moment, I didn’t realise what happened. Soon enough I was rushed to the hospital for stitches while the ladies of the house went on a frantic search for the precious Gold. 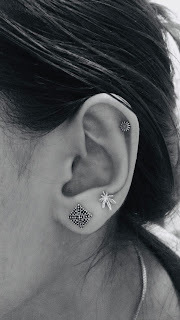 Amidst the excruciating pain, my first question to the doctor was – after the stitches, will I have to get the earlobes pierced again and will they ever be able to take the load of heavy/big earrings? The doctor was stunned at my intelligent doubt and she promptly asked somebody to get basil/tulsi stems, placed it where the hole should be and then stitched the hanging and bloody lobe around it. Of course, this wasn’t a great deal medically and all kinds of earrings were back in my life within a few months. Fast forward to college life. In 2007, with two of my friends, I went for second piercing – manual, not a piercing gun. It was painful, manageable. I was very proud of the look of it. It was healing well. All three of us got colourful new studs matching to dresses. Not yet ready to change the originally pierced ones, but we had spare stones in place. What if we don’t get the best studs again at the same place! What if someone else buys and we lose on those exact studs! Teenage. One adventurous evening, I fell in the bathroom with one side of my head on the bucket (Indian bathroom :D). That side could have been cheeks, head, forehead. Urm no. It had to be the newly pierced area, started bleeding, went from healing to a fresh wound. I was crying, Why me! It was that stage in life when my wound mattered less and the two friends’ colorful shiny faux diamonds stung more. In a couple of days, puss started forming and finally I gave up and removed the studs. Let’s travel to 2014. Once again I decided to go the piercing way and this time I accomplished the task with flying colors. I wasn’t going to stop at this. Got my helix pierced on one ear – that is the upper part of the ear. Now this one is cartilage piercing and takes anywhere around 4 months to heal, so I took one side at a time because I am a side sleeper and won’t change that for anything. No problem no drama this time hurray! After an year’s time, I got the other side helix done too. However removed it in a couple of months because it didn’t feel right, some tingling somewhere – I got rid of it. In a few months, got it done again. Now let the drama unfold. Enter: Asymmetry. Every person I look at enlightened me with signs of asymmetry between the two helix studs; I believed every one and saw the imperfection myself. Removed the stud and went under the needle yet again for the seemingly precise spot. I was happy, the world was satisfied, the jewelry shop man was thankful to never see me back again. There is light at the end of every tunnel. Sure! The tunnel I travelled was quite a long one, just over a span of 18-20 years. Let there be light until I make up my mind for another stunt. For now, my piercings and I are at peace and love each other dearly. ‘Are you ready for your order?’ asks the waiter. Familiar?? 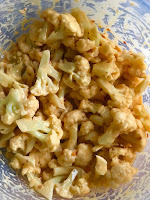 Gobi Manchurian or Cauliflower Manchurian is a staple appetizer for most of us, right. Unless otherwise we plan on trying something ‘different’. Who doesn’t love an Indo-Chinese item that hits all the right spots and leaves you delighted! Preparing Manchurian or for that matter any Indo-chinese item at home is not too complicated, it’s just about a few sauces and mixing and tossing. 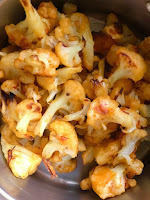 This time around, I decided to bake - instead of frying the battered cauliflower. Less oil, same taste! One important prep-work is chopping the ginger and garlic finely. I won’t say it’s a tedious or difficult task; but it sure is much easier with a good quality large knife. That makes it easier to chop the ginger and garlic very fine. My best knife till date for this is The Pioneer Woman’s stainless steel Santoku knife with rustic wooden handle. 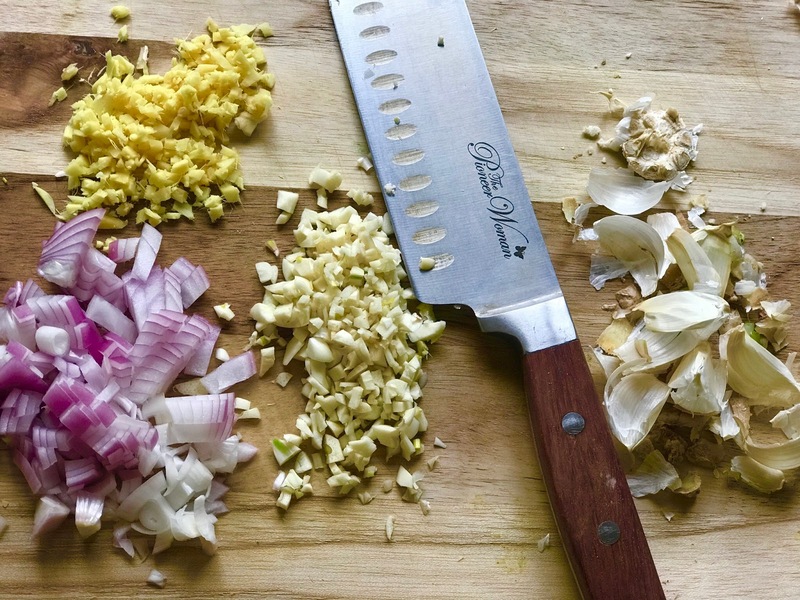 It is a medium priced knife which chops beautifully. Another of my favorite knives is a ceramic knife by Farberware. Though this one is not great for chopping ginger/garlic, it slices veggies and onions like a breeze. Knowing your knives is very important if you value your time spent in the kitchen chopping and slicing. Most of us enjoy cooking, yet how we wish chopping was done by someone else right?? Well, if you choose a right knife for the right job, that will also be an interesting chore and you will start enjoying it. That said, check out a few stunning Japanese knives here along with the nitty-gritty of each Japanese knife explained in a language easy to follow. 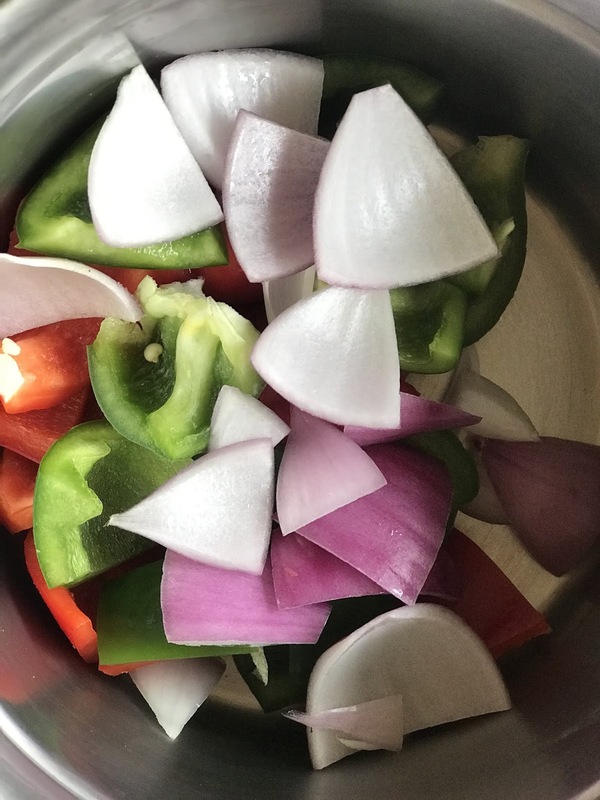 This site by Joe Hughes is a haven for cooking tips and for reviews and suggestions on kitchen appliances! Ah, while chopping the Ginger-Garlic into the tiniest bits is crucial, there’s another indispensable ingredient that I use for my Indo-chinese recipes – Schezwan Chutney by Chings. It works like magic to flavour the whole dish. Mix the All purpose flour, corn flour, schezwan chutney, oil and salt in a bowl and add 1-2 tbsp of water, make a paste. We need a fairly thick paste that can coat all the florets evenly without leaving us with leftover batter. Drop the cauliflower florets into this paste, coat each of them well. Pre-heat oven to 350 degrees Fahrenheit. Line a baking tray with foil or parchment paper and place each floret on it. Bake for about 30 minutes, turning them once after 15 min. Next brush the florets with some oil and increase the heat to 400 degrees and bake for 5 min for crisp florets. Once done, remove into a bowl. For the sauce, take 3 tbsp of oil in a pan/wok. Chop Ginger, garlic and green chillies finely. Cube the bell peppers and remove layers of quarter of one onion and keep aside. Chop the rest of the onion into small pieces for the sauce. Add ginger, garlic and green chillies and fry for a minute. Next add finely chopped onions, onion layers or squares and bell peppers and the bulb part of scallions. Add pepper powder, vinegar, soy sauce, schezwan chutney, salt and let them all enjoy each other's company for a few minutes. Next add the slurry of corn flour plus water so that we have a saucy texture. Once these veggies are cooked in the sauce, add the baked cauliflowers and chopped scallions or spring onions and coriander leaves. Toss like a pro and serve hot! You won’t have to worry about refrying or reusing any deepfried oil, thanks to the baked gobi. Even better, avoiding deep frying translates to fewer calorie intake! Just enjoy this Manchurian as an appetizer or a side to fried rice/noodles! !